Are you in Barcelona? Don't miss this 5 things to do in! Travelling to Barcelona? Get a plan! If you are a musical lover the city offers a wide billboard with very different styles and genres. Now that Christmas dates are approaching, a musical that has become a classic is El petit Príncep, based on the story of Antoine de Saint-Exupéry. You will find it in the Sala Barts. For fans of the King of Pop, at Coliseum Theater you will find Forever. The best show about King of Pop, which makes an exciting journey through music and the career of Michael Jackson. To discover the essence of the Catalan musical, you can’t miss a show by the company Dagoll Dagom, one of the most emblematic of Catalonia, and at Teatre Poliorama you will find Maremar, his latest project. In Tívoli Theater you will find Flashdance for those who like to dance and enjoy mythical songs like Maniac or What a Feeling. And for children the offer is very varied and we can see Alícia al país de les meravelles at the Romea Theater or Tadeo Jones, una aventura musical at the Teatre-Auditori de Sant Cugat. If you only spend a weekend in Barcelona you can visit the second-hand markets where you will find original items at very affordable prices. One of the most consolidated is Lost & Found market, a mix between the Queensday in Amsterdam and the garage sales in the United States. In the Raval district there is Fleadonia, a street market full of clothes, books and second-hand music in very good condition. And the Palo Alto Market is a creative market with contemporary and vintage art, food trucks and a really nice atmosphere. One of the most powerful reclamations in the city are the innumerable music festivals that are held throughout the year. Some of the most internationally known are Sónar, the most important electronic music festival in Barcelona, and Primavera Sound, with local and international groups for all tastes. But there are festivals for almost all musical genres, so if you are jazz lovers you can go to the Jazz Festival of Barcelona, or if you want to discover flamenco you have the festival De cajón! And if you travel to Barcelona in summer, you can’t miss the Barcelona Beach Festival which takes place at the Parc del Fòrum and La Platja de la Pau. If you are in Barcelona at Christmas time you can’t miss the Catalan Christmas traditions. In the square of the Cathedral of Barcelona, there is the Santa Llúcia market, a market where you can buy all kinds of Christmas objects and decorations. There you will discover the most emblematic figure of the Catalan nativity scene: the “caganer” (literally, the man who poo). 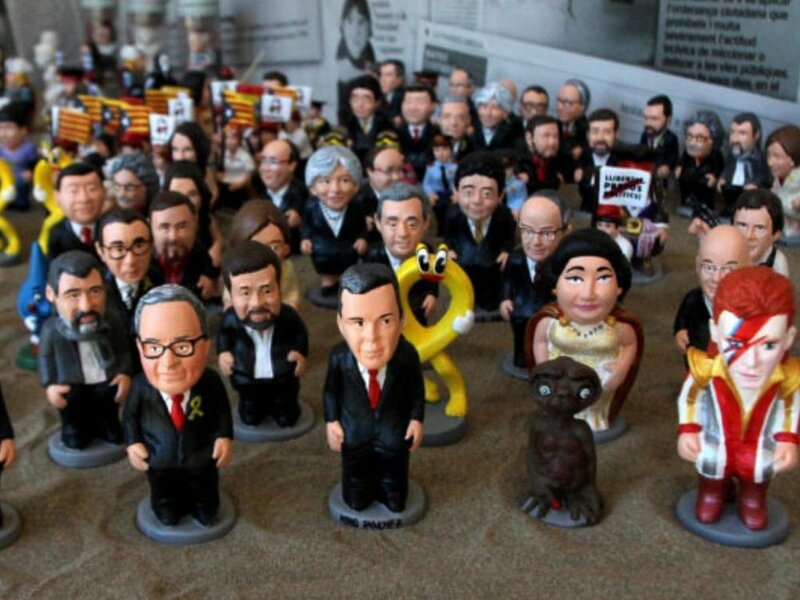 Traditionally, the figurine was a shepherd with “barretina” (typical Catalan hat), but to internationalize it there were “caganers” of world-famous characters such as Leo Messi, Donald Trump or Woody Allen. Another Catalan tradition that you can’t miss is the “tió”, a tree trunk with legs and a smiling face that children expect every Christmas with enthusiasm. At the Santa Llúcia market you will find all sorts of “tions”, “caganers” and Christmas stuff. Barcelona is much more than it appears in tourist guides and travel books. The Catalan city hides secrets and corners waiting to be discovered by the most curious eyes. If you want to know Barcelona from a different perspective, Other Eyes offers four unique and one-hour and half routes. With the Night route you will discover the darkest streets and the dark stories that hide. The route of the Civil war will take you to places where the marks of this conflict are still visible. The Gothic route strolls through the historical and even magical legacy of Barcelona that often goes unnoticed. And the The Language of Stones route will show you the messages that hide stones and walls that we often face but with which we do not pay the attention that deserve.